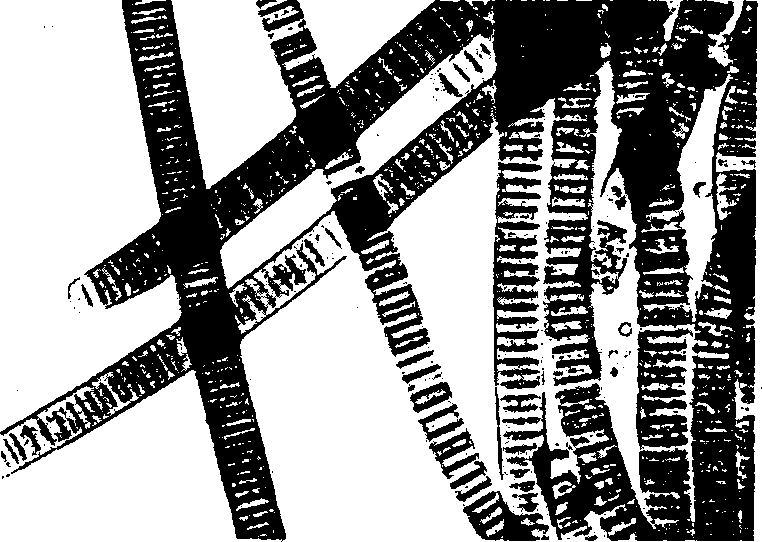 Oscillatoria is a genus of filamentous cyanobacteria. It has more than 100 species. It is named for the oscillation in its movement. Filaments in the colonies can slide back and forth against each other. Thus the whole mass is reoriented to its light source. It is very common in moist places rich in decay organic mailer. It is commonly found in watering-troughs waters like streams, roadside ditches, drains and sewers. It is mainly blue-green or brown-green. It forms thin blue green mucilaginous coating on the surface of flowing water. Its one specie is found in hot springs. Some species like 0. .formosa and O. princeps are symbiotic. They form association with the nitrogen fixing bacteria. Some common species are 0. fomosa, 0. prolificn and 0. formosa. Its body is composed of single row of cells. These cells form trichomes. Its trichomes are unbranched filaments. They are covered by very thin mucilaginous sheath. All cells of a trichome are similar in shape except apical cells. The apical cells are convex at the tip. 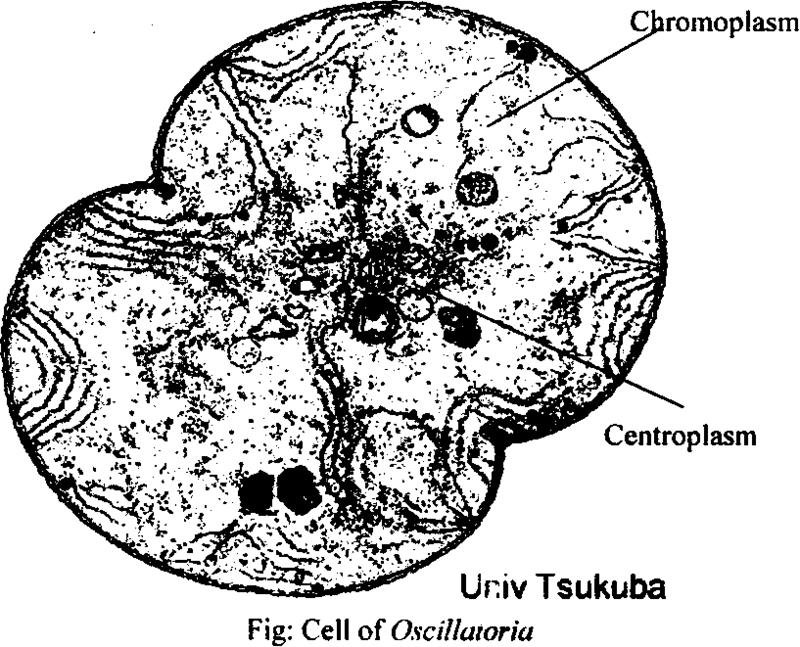 All other cells arc broader and cylindrical. In some species, the apical cells may end in subacute point. In some cases, it may have cap or calyptra at the tip. Some species have narrow trichome. They have cylidrical cells with their length equal or greater than the breath. 1. 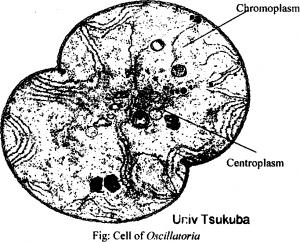 Each cell has outer cell wall. This wall consists of three layers. 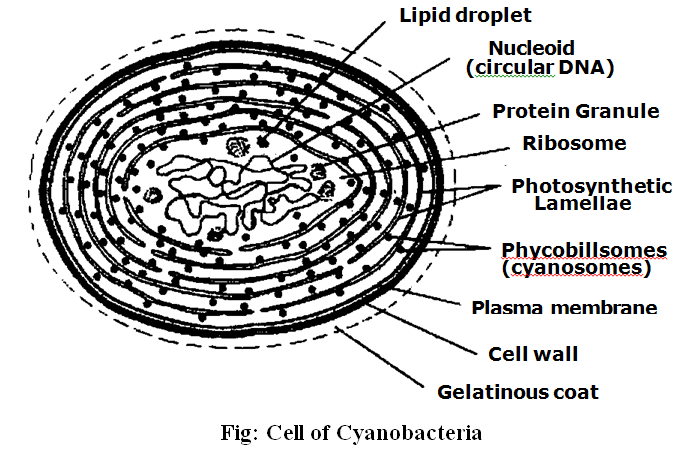 The inner layer is thin cellular layer, medium is pectic layer and outer is mucilage layer. Protoplasm is composed of two parts. The peripheral part is called chromoplasm. It contains pigment. Hence it is colored. The central part of protoplasm is colorless. It contains nucleus like material called central body or chromatin granules. in some colonies pseudo-vacoule are present. Their reserve food material is glycogen. In some cases, oil drops may be found as reserve food material. Aseuxal and sexual reproduction is absent in Oscillatoria. Oscillatoria reproduces by fragmentation. 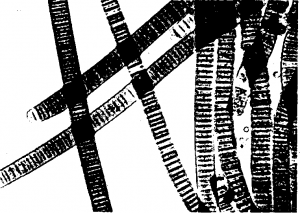 Oscillatoria forms long filaments of cells which can break into fragments called hormogonia. The hommgonia can grow into a new, longer filament. Breaks in the filament usually occur where dead cells (necridia) are present. In some cases, hormogones form separating discs at breaking points. Accidental fragmentation also occurs in Oscillatoria. In this case, trichome may break in to many fragments. Each fragment develops new filament.